Let’s get this clear. I’m Black. A Black Puerto Rican. Black and proud, you hear me? Stop erasing my blackness please. Thank you. This is the graphic someone reposted on social media that sparked some Latinos/as to emphasize in comments how they are not black. 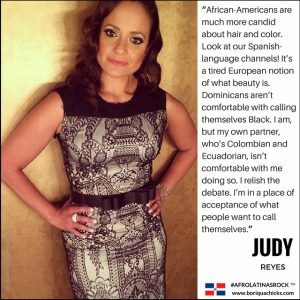 A few weeks ago I was relaxing and doing my usual morning scroll through social media and saw a repost of a graphic BoriquaChicks.com created with a quote from Dominican actress Judy Reyes. In the image she expressed that she has no problems with being called black and commented on how it makes her partner uncomfortable. I already knew that there would be comments frowning upon her statement (that she is with someone who doesn’t embrace her identity). 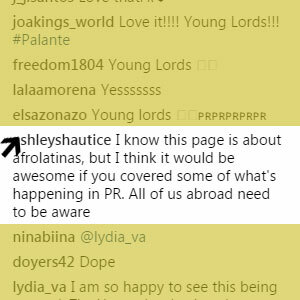 However, I looked at the comments below the repost and witnessed Latinos/as of all backgrounds making anti-blackness statements about being mixed and wishing people would accept that they are not black, they are not African-American, and they wanted no association. What shook me a little were the comments coming from phenotypically black Latinos/as saying they were not black. I’m not going to lie…I cringed. 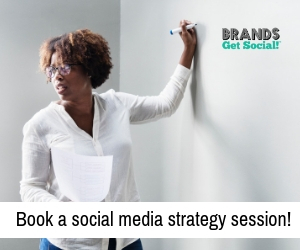 Now and then we receive feedback (emails, comments on social media, etc.) with anti- blackness statements. That comes with the territory. 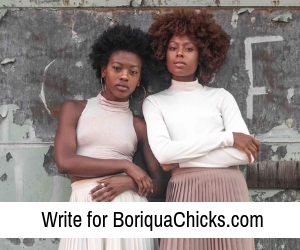 My sister Rebecca and I are Black women celebrating being Puerto Rican, with a website called Boriqua Chicks… but hitting you hard with our blackness. We know we make people uncomfortable at times. It’s interesting to me how some Latinos/as feel the need to try and check us by saying we talk too much about blackness, yet, when other media outlets consistently feature white Latinos/as on their platforms, these same people don’t troll their outlets and complain. 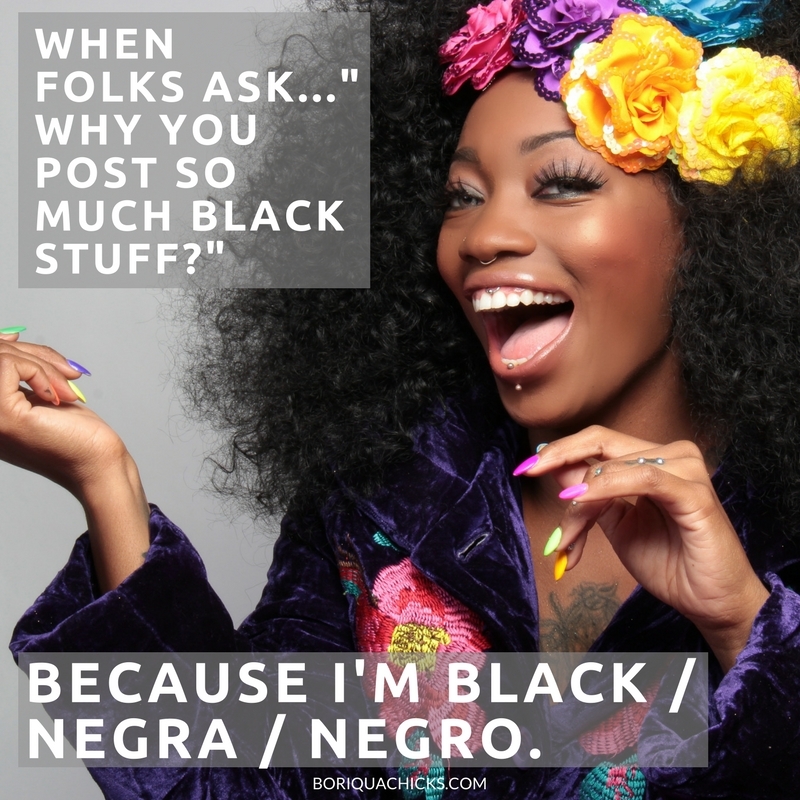 I’m sure we’ve missed certain opportunities in the blogging world because of our unashamed display of blackness. That’s okay with us because we know who we are and we are proud of our roots…our African roots. The graphic below captures how we feel. If you agree, feel free to download the graphic, post and tag Boriqua Chicks. I am a a proud Black Dominicain I love this page. I appreciate the unapologeticness of this page. Thank you. The more we stand up the more they will have to accept us. My sister teaches elementary school age kids in Bushwick, Brooklyn. The majority being Mexicans, Hondurans, Salvadoreños, Ecuadorians, and Colombians. She says calling someone Black is taboo to them. Their reaction is one of uneasiness and awkwardness. She finds their reaction so odd and sad. I love my skin color and my looks!